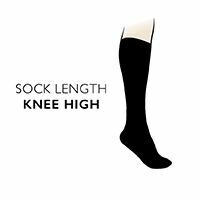 In a longer knee length leg, our own SockShop men's Storm Bloc with BlueGuard Long Wool Blend Country Socks are scientifically tested to be the most durable socks of their type. 30 times more durable than a standard branded walking sock, BlueGuard yarn brings astounding anti-abrasion qualities to these natural wool, cotton and performance synthetic blend socks. Storm Bloc with BlueGuard Long Wool Blend Country Socks are very serviceable all-round country socks, ideal for longer riding boots and Wellington boots. Each pair is terry cushioned to increase comfort while cutting down rubbing, impact shock and foot fatigue. They have extended heels, woven-in arch supports, durable calf panels and reinforced toe seams. Storm Bloc with BlueGuard Long Wool Blend Country Socks have a lifetime guarantee in the unlikely event that a hole is worn in them.